A pioneering study to assess the link between regular cycling activity and reduced hip pain or need for hip surgery has begun this month and local residents are being invited to sign up now and get involved. 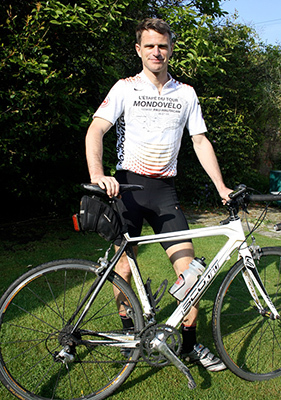 Cycling Against Hip Pain (CHAIN) is a concept proposed by Mr Robert Middleton, Consultant Orthopaedic Surgeon and hip specialist at the Royal Bournemouth Hospital, which is a leading centre in hip replacement surgery. The study is based on evidence that indicates that regular cycling activity and education could reduce symptoms for people with hip pain, stiffness, arthritis and reduce the need for surgical intervention. A collaboration of healthcare and activity providers; BH Live, The Royal Bournemouth and Christchurch Hospitals NHS Foundation Trust, Dorset Clinical Commissioning Group, Active Dorset, Bournemouth University, Bournemouth Borough Council and Christchurch Borough Council have worked together to launch the study in the local area. The trial will be funded by the providers at no cost to participants. The CHAIN study is calling for 120 local people who have been diagnosed with osteoarthritis of the hip to participate in the study. Participants must be aged 45-65, and registered with a GP in Bournemouth or Christchurch. The first group of 15 participants will start the programme in early October, with further groups starting at regular intervals over the coming months. People who meet the criteria can ask their GP to be recommended to take part in the free eight week programme at the Littledown Centre and Pelhams Park Leisure Centre, Bournemouth. Anybody interested in taking part can find further information and a GP referral form online at www.livingwellchoices.co.uk/chain or they can call 01202 436880 to talk with a member of the CHAIN team. After the initial eight week programme, participants will be encouraged to continue cycling, with follow-ups at six and twelve months to monitor their level of hip pain. Participants will also be offered mentoring support and training with a view for them to encourage other people to participate in the scheme. The study will be completed by autumn 2014, and if the results are positive the intention would be to roll out the programme nationally to benefit the thousands of people suffering from hip pain and osteoarthritis. For further information and to see if you are eligible for the programme telephone 01202 436880 or visit www.livingwellchoices.co.uk/chain and download a GP referral form.